UK Free TV now has a new feature: the site now shows you the ten nearest mobile phone masts to your chosen location. 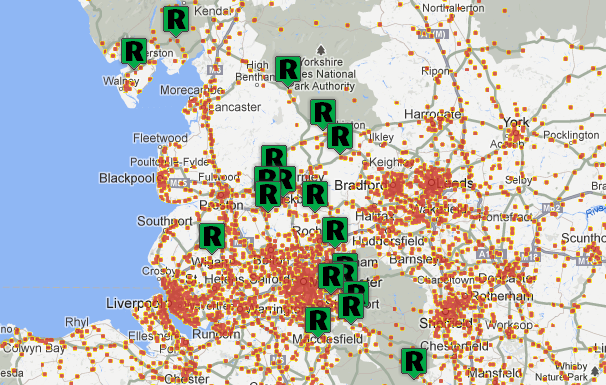 These are the most likely places where 4G wireless broadband base-stations will be placed. If these are within 1.5km of your Freeview aerial, you may need to fit a filter to your aerial cable. There are two new features on UK Free TV from today which integrate information from the Ofcom 'Sitefinder' Mobile Phone Base Station Database. The first is a map of all the locations in the UK which are within 1.5km of a mobile phone mast, and are the areas where "at800" interference may occur. If you're not marked in red on this map, you are more-or-less guaranteed to be free from problems with Freeview and 4G broadband. The Freeview interference from 800Mhz 4G 2013 map also shows the Freeview transmitters that are going to retune in the coming months (to clear C61 and C62 for 4G). The next feature, which has been integrated into the existing UK Free TV prediction and mapping system â see My Freeview - shows the nearest ten mobile phone masts in addition to the existing Freeview (and Saorview) transmitters and their coverage areas. The new yellow icons, which you will need to zoom into the map (using the mouse wheel or the zoom control on the map) to see, show the logos for EE ("Everything, Everywhere"), 3, Vodafone and O2. Where a site has equipment from more than one operator, a phone icon is shown. There is also an icon for "NetworkRail" who own the masts on their land. The masts chosen are limited to existing "900MHz" sites for Vodafone and O2, plus all sites for 3, and the "1800MHz" sites for EE. At the moment, this is the "best guess" of locations for 4G "at800" base-stations. There is no way of knowing at this time when the different network operators are planning to introduce 4G "at800" services, and they are only committed to providing eight weeks notice of the start date. Read my BLEEDING into message, see my posts>. Ropbert McClymont: Just to be clear. The current EE 4G services are NOT using the 800MHz band, and will not interfere with Freeview. The only live service at the moment is in South East London. I heard on NW TV news that their freeview channels have been changed to make space and there are a lot of problems. We live in a small village called Longnor in the Staffordshire Moorlands - looking at this site our mast is in Earl Sterndale - we and our friends have had no picture on many channels for over a week - is this to do with 4G and if so what do we do?? - I would have expected more info from you!!! This site is independent of broadcasters. The information is provided to help viewers. I would suggest that you may be receiving from Sutton Coldfield. I took a look around your village on Google Streetview and all aerials I saw are directed to Sutton Coldfield. However, there have, according to reports, been no works affecting its TV signals. There are also no changes due to its broadcast channels. If your aerial is directed to Earl Sterndale then you would only receive Public Service (PSB) channels from there. Any reception of the Commercial (COM) channels would be purely by chance as they would be coming from elsewhere, that is from a direction (and polarisation) which your aerial doesn't point ?EUR" probably Sutton Coldfield, if at all. what do i need to do to get it back ? i miss it desperately! Pamela: If your TV or box has manual tuning, try a manual scan of UHF channel 48.
steph: The problem referred to can be caused by a number things as well issues related to the terrain surrounding your area, therefore, its not really possible for anyone to offer advice unless your location is known, this preferably given in the form of a post code or one from somewhere nearby, e.g: a shop / Post office. I have a relative who has difficulty getting ITV3 at times. The relative has Freeview, but not Freesat. The location is S66 8BT. Any help on this, thanks. Sasa.